One of those links should take you to the wireless routers login page. If not keep reading. If it did and you do not know your routers password, try this. Default Password List. Some routers have the default username and password and even IP Address on a sticker on the bottom of the device itself. If you do not know your Firewalls password or the link did not get you into your router, keep reading for troubleshooting steps. Find your router in “Network Infrastructure”, click on it! If your router’s IP is not 192.168.1.1, then you may have to figure it out on your own. First of course, look under the wireless device for a sticker stating the IP Address. This is common and best practice. If not follow these steps. Go to Start Menu, then Run, type CMD, hit enter. In the black box type in ipconfig(a command for networking). The Default Gateway is your routers IP Address. However you do have to be connected to it already to get this number. 1. Click Start go to All Programs, click Internet Explorer and a window will open up. 2. Type in http://192.168.0.1 or http://192.168.1.1 in the address bar and press enter. Note, your router IP address may be different. See the chart below for possible IP’s for Linksys, Belkin, Dlink or Netgear routers. Many devices have the default gateway and default password printed on the bottom of the actual hardware. 3. A Router Password Prompt will appear. If you do not know your router password try using one from the list at the bottom of this page. If those do not work you may have to hard reset your routers firewall. 4. You’re in! Unless the default user name / password from the list below didn’t work. In this case you more than likely changed your password and will need to hard reset the router(directions below). Make sure you are connected to the router. I know this should go without saying but make sure you are actually connected to the router before you try to access it. It’s best you connect direct with a cat5 cable instead of trying wireless just to eliminate one more possible issue. Internet Explorer has spyware or a tool bar blocking you? Try bypassing Internet Explorer. You can use another Internet Browser or what I suggest try using the Run Command. On your keyboard press and hold the Windows Key and then the R key. This will open up a little run box. In there simply type your routers ip address. For example http://192.168.1.1 and press the OK button. This should open your default browser taking you directly to the routers login prompt bypassing any search toolbar extensions that may have been installed without your knowledge. SafeMode With Networking Try Windows Safemode with Networking. Reboot your computer and continuously press the F8 key until you get a boot options prompt. Choose Safemode with networking and once you’re booted up try the above options in Safe Mode. To hard reset the router you simply grab an item such as a paper clip, thumb tack or anything small like that and push it in the tiny reset button hole on the back of the router. Hold it in for about 5 seconds and release. On some routers you need to hold it in for about 30 seconds so it’s better safe than sorry to just hold the reset button for 30 seconds. The router will restore itself to factory defaults and you can try the IP address and user name password combination below. Note that you should only hard reset the firewall as a last ditch option. Especially if someone set it up for you. The reason being they may have set up advanced options such as port forwarding or set up an XBOX. If you’re looking to upgrade your wireless router to the best one with long range, strong signal and added benefits such as a file server and a print server then look no more. ASUS has made a BEAST of a router with dual frequencies, a USB 3.0 port and a USB 2.0 port for File or Print Serving, external FTP Access, up to 8 Guest Network SSID’s(this is fun because you can make a bunch of fake Networks to tick off your neighbors). Anyways, you should check it out. I have a d-link router. Model number dwr-113. I want to access the control panel to change some settings for the wireless on it. I go to http://192.168.0.1/ in my browser and it asks me for the username and password. 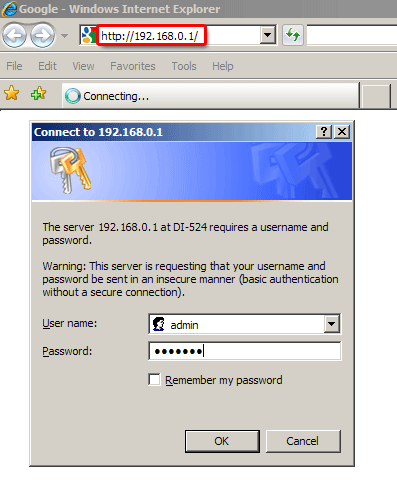 I put in admin for the username and leave it blank for the password. This should work, but for some reason it doesn’t. I have never accessed the control panel before. How can I get in? Thanks. You are correct, that should indeed work. All I can suggest is a hard reset of the router by taking a safety pin of some sort and pushing in and holding the reset button for 30 seconds. If this works it should go back to admin blank.